While I wouldn’t use the term “onomatopoeia” with quite young children, I love to find literature that introduces them to the fun of playing with words. Two fantastic children’s picture books for starting off an exploration of onomatopoeia are I’m a Dirty Dinosaur by Janeen Brian and Ann James, and Thunderstorm Dancing by Katrina Germein and Judy Watson. I would certainly use both books with children of all ages. This playing with words can be extended to a family or class collaborating over a collection of onomatopoeic words. Kids might like to illustrate their favourites. Apart from animal noises and sound words kids may already know, poetry, stories and songs will also be rich sources for more. Australian author, Alison Reynolds, has a list of many onomatopoeic words she has collected. The Australian Curriculum stresses the importance of reading poetry and prose aloud, to enhance enjoyment. Comics and graphic novels are also great fodder for onomatopoeia collectors. Kids who love superheroes will certainly be familiar with Biff! Zap! and Bang! 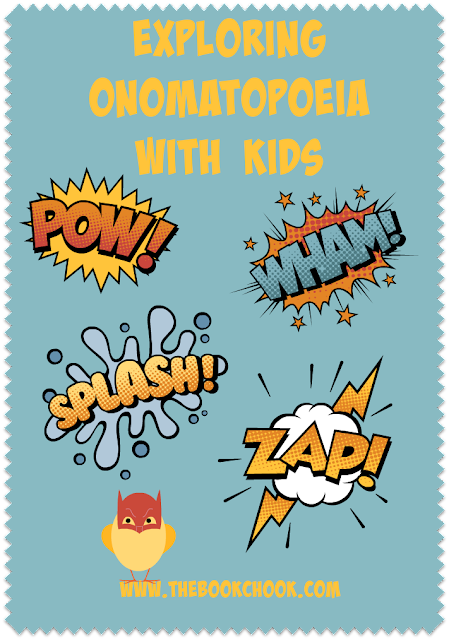 Help kids explore the use of onomatopoeia for themselves while they create their own cartoon/comic. If you’re new to comic editors, check out my free PDF, Using Comic Editors with Kids. Or read my article Using Comics for Information Reports. Image editor, Pic Monkey, has lots of great comic word art and effects we can use - look under Themes/Comic Heroes. I love onomatopoeias. My writing is full of them. They're such fun to read aloud and I love how they give me a licence to make up words. I hadn't thought about it that way, but I will in future - a licence to make-up words. Thanks, Sandy!